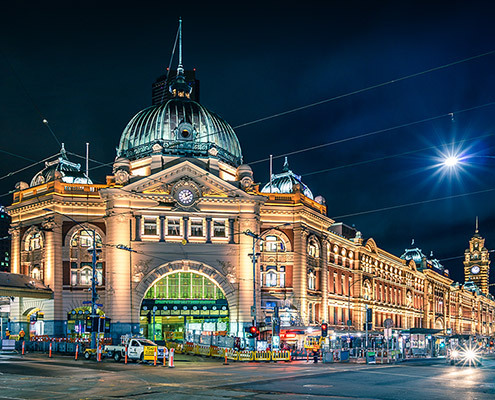 The present Flinders Street Station was completed in 1910 to the design of architect James Fawcett and engineer H.P.C. Ashworth, both of the Victorian Railways Department. 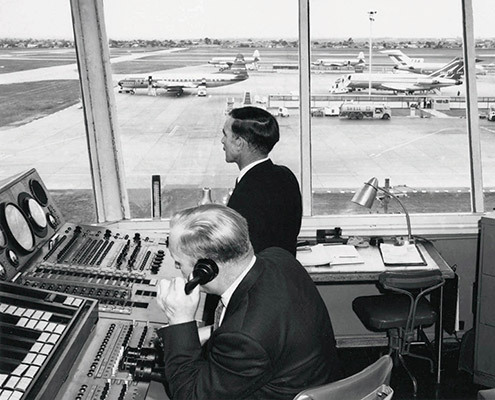 Our association with it goes back to 1979, when Peter Lovell first investigated the paint colours. 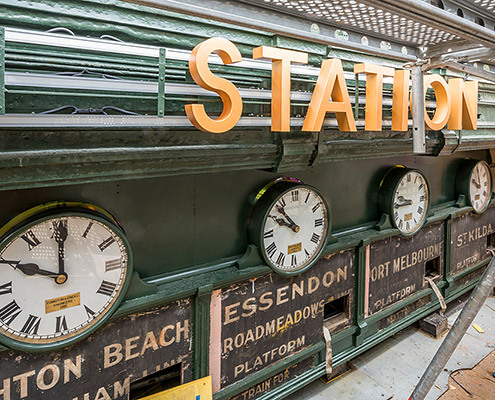 Since then we have prepared a conservation study (1990, Allom Lovell & Associates), a conservation management plan (1999), a CMP review (2012) as part of the preparations for the Flinders Street Station Design Competition, a condition report (2015) and a heritage impact statement (2016). 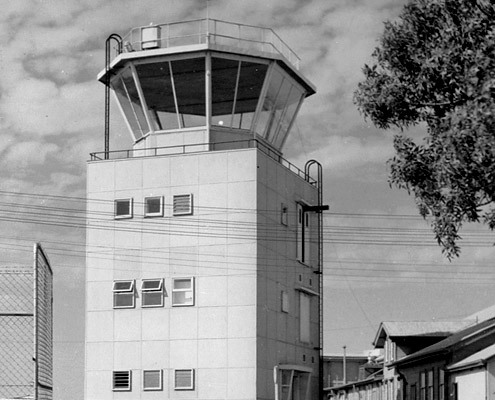 The building has always played an important part in the history of Melbourne and is one of the city’s most recognisable landmarks. Despite the many changes to railway infrastructure since 1910, the form and fabric of the building is essentially intact. Seismic strengthening was a major component of the works in this phase. Although the building is structurally sound, it was built in a period in which lateral walls played little part in the overall strength of a building or its ability to survive earthquake vibration. To address this, a seismic strengthening programme was developed that included roof works as a key element. A structural slab has been laid on top of the original roof slab, incorporating lateral bracing. Metal clad steel mullions have been installed to the roof side of the brick parapets, which have been capped with painted metal copings, enhancing the waterproofing to the upper levels of the building. Other works at roof level included removal of the non-original concrete screed, installation of a waterproofing liquid-applied membrane, stormwater drainage works, repairs to zinc ventilation shaft caps, repair and reinstatement of missing elements to the copper cladding of the pavilion roofs, and localised repairs to the 12m diameter copper dome of the main pavilion. The three-storey building is constructed in brick (4,000,000 of them) on bluestone foundations, with some granite at ground level, and cement render detailing. The south facade, facing the rail tracks, includes large areas of zinc sheet cladding, cut and painted to look like stonework. Structural rectification works have been carried out throughout. 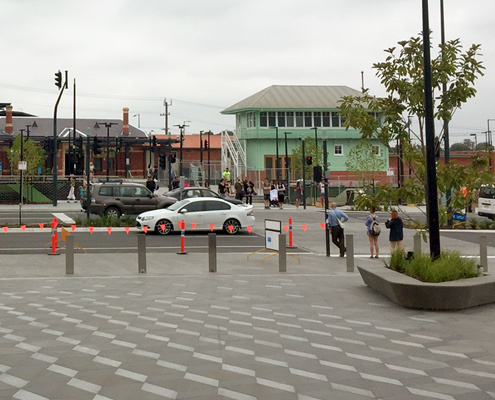 The brickwork has been cleaned and repointed, with tuck pointing on the long Flinders Street facade and the clock tower. The render work to decorative bands, pilasters and corbelled cornices had been repaired, and new lead overflashings installed. Of the building’s 600 windows, few needed replacing, but all are now refurbished and operable. The three large arched windows at the station entrances, two of which feature painted glass, have also been refurbished. The sheet metal on the south facade and pressed metal details on the northern windows have been repaired. 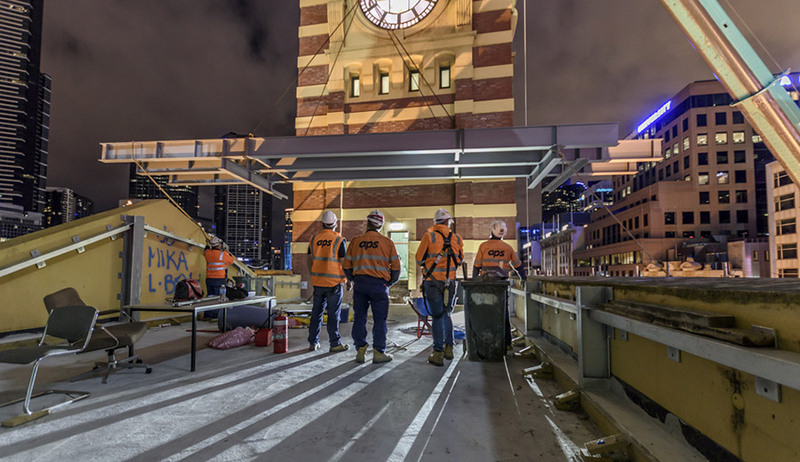 Early in 2017, the clock in the tower facing Elizabeth Street was stopped to enable works. Strengthening of the ten-level clock tower formed part of the seismic programme — an internal system of post-tensioned steel cabling, anchored to steel ring and tie beams. Water ingress issues have also been rectified. The four 3.35m diameter dials have been refurbished, and a new drive mechanism installed. In the process, the team discovered a mechanism at the top of the timber-lined counterweight shaft that was used to keep Central Rail Time for Victoria. 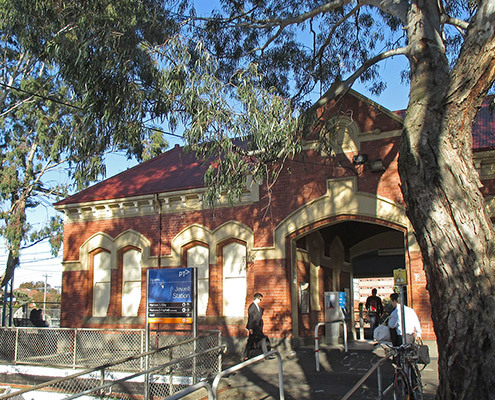 The exterior of the station and its clock tower has been repainted to the original 1910 colour scheme — a pale sandy colour for the render, with timber components in green and metal shingles in red to match the brickwork. Confirmation of the scheme was made by Peter Lovell and the Centre for Cultural Materials Conservation at the University of Melbourne following further investigations. A new LED exterior lighting system, installed by Darkon and Lumascape, completes the transformation.